Paine also admitted that things will get fiery during the Test series. After a rather ordinary start to his Australia tour in the first T20I, Virat Kohli announced himself in the third and final match of the series by smashing a half-century in a winning cause. With the much-awaited Test series set to commence on December 6, all the excitement is about the battle between him and the Aussie pacers who are capable of running through any batting line-up. Tim Paine expressed confidence in them as well ahead of the series opener and believed that they will be able to combat the Indian skipper. Kohli, on his last trip to Australia, smashed four centuries in as many Test matches and is coming off a sensational England tour where he scored almost 600 runs in five matches. The home side knows that Kohli’s wicket will be of paramount importance to them during the series as the Indian batting largely revolves around him. Dismissing him early will be a huge dent in confidence for the visitors and it will be interesting to see with what plans do the Aussie bowlers come up. 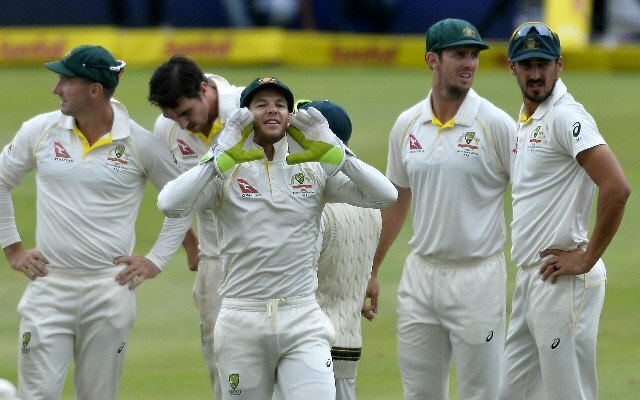 Tim Paine, while speaking to cricket.com.au, was confident that the likes of Pat Cummins, Mitchell Starc and Josh Hazlewood will be able to unsettle Virat Kohli. He also admitted that the things will get fiery in the middle at some point in time during the series. However, the Aussie skipper was mindful of not crossing the line with the team culture being questioned by many. “I think our fast bowling attack if they play purely on skill, they’re going to trouble him. At times when we get too emotional, we can lose our way a little bit. So it’s a really fine line. There’s going to be times when they’re going to get a bit fiery, I’m sure. But we need to be mindful of keeping ourselves calm enough so we can execute our skills as well,” he said. The first Test will be played in Adelaide where many believe that Team India can trump Australia with the conditions similar to sub-continent. A lot will depend on which team starts the series on a better note and the trend might follow for the rest of the matches.